In B R Stateham's Insatiable, PI Roman Dalton gets a request from an old friend to help him solve a murder. A murder so horrible, so brutal, it had to be caused by a werewolf! Dalton is approaching his 'change' and at the same time trying to solve a vicious crime. How does he stop himself from leaping onto his friend, when the time comes, and making his old buddy an evening snack? How does he find and remove from the city a werewolf who happens to be much older, and far stronger, than he is--and not create a panic among all the potential meal tickets walking around? 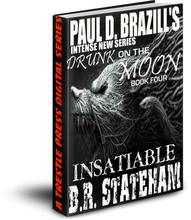 Find out in Drunk On The Moon Four: Insatiable by BR Stateham based on characters created by Paul D Brazill. For the first time in this series a writer concentrates on the feelings Roman has in the run up to a full moon. The author explores the nature of the changes using strong descriptive writing that really gets you into Roman’s head. We also get a more solid sense that Roman might actually be a good and talented PI who knows his job. In short a more serious story but with, as you would expect for this series, a few laughs along the way. There are plenty of twists and turns to keep you interested. I was left with the satisfying feeling you get when you have really enjoyed a good story well told.